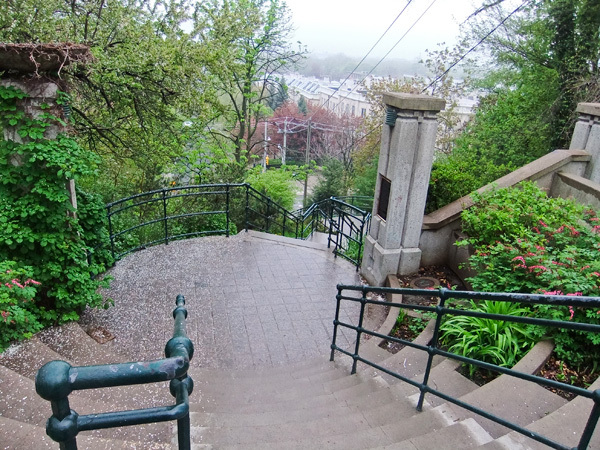 Named to honor the locally significant Baldwin family, who once owned and developed the land on which they are situated, these monumental steps now constitute a public right-of-way that ascends the steepest section of an escarpment running through much of the City of Toronto. 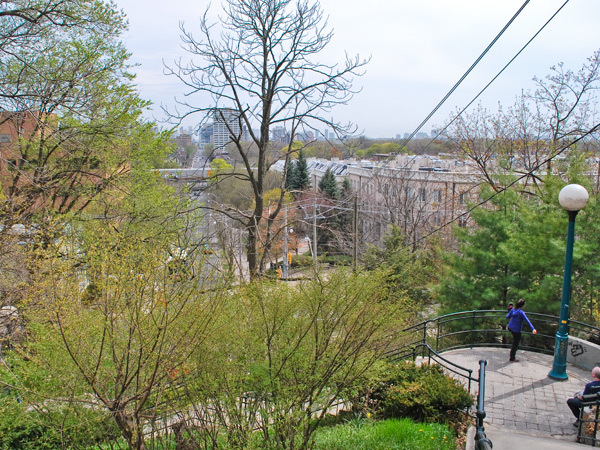 In the early nineteenth century Dr. William Baldwin laid out the straight, north-south Spadina Road, which passed through the city but was diverted at this location due to the steep slope of the escarpment. 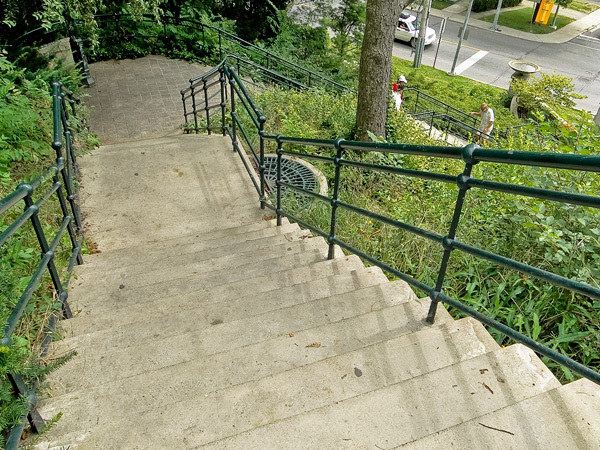 To accommodate this diversion, wooden steps were built to extend the road’s trajectory between Davenport Road at the bottom of the cliff and Austin Terrace at the top. A more permanent staircase was in place by 1913. The Province of Ontario expropriated the land surrounding the steps in the 1960s for the construction of a freeway, never built. 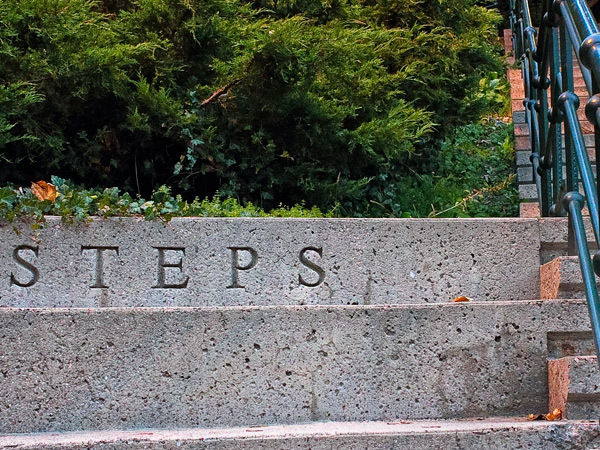 In 1984 the Province leased the steps to the City of Toronto, which rebuilt them three years later with railings and larger landings. 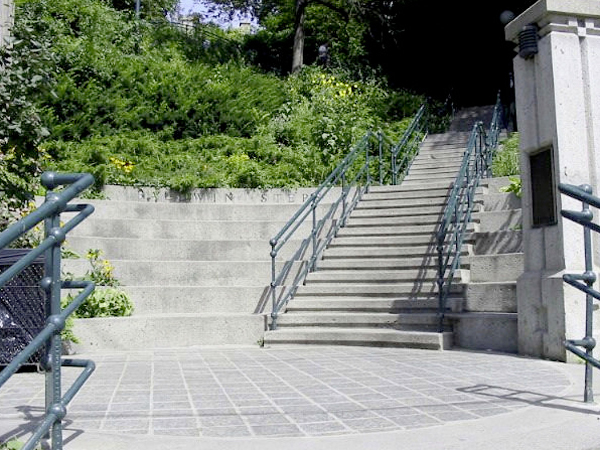 From their base at the intersection of Spadina and Davenport Roads, the concrete steps rise to a semi-circular landing flanked by pillars and partially encircled by an arcing amphitheater. The landing is shaded by mature trees and surrounded by planting beds bordered by a low stone wall. The stairs, 134 in all, switchback across the steep escarpment through natural understory plantings to a circular viewing platform at its mid-way point, while a third landing at the top, surrounded by a metal railing, duplicates the form of that occurring at the bottom of the steps.